I'm so honored and excited to share an interview Elite Daily just did with me, Take A Look! This Month I will be assisting a Yogaworks intensive Teacher Training in Santa Monica, led by Malachi Grieves. A lot of you have asked me why I choose to do this now with a flourishing Ayurveda practice and a full teaching schedule. I Believe We Need To Constantly Challenge Ourselves and evolve through continuous curiosity, right action and focused intention to move forward, rather then standing still or being stuck in a rut. I've been contemplating the role of a Teacher Trainer a few times in the last several years, but have always backed away from the time involvement due to having 3 little kids. The time has come for me to step up my game and into the role of a leader to teach others about the transformative power of Yoga. This month I am excited to assist Malachi Melville in her intensive TT format at Yogaworks and support her students as they find their voice and build their teaching skills. I Am Looking Forward to brushing up on Yoga philosophy, anatomy, the yoga sutras and the subtle body. I love being a student, and I look forward to supporting aspiring teachers on their path. I thrive on challenges and opportunities and welcome change. I invite you all to continue practicing while I'm gone with my fantastic subs, fellow teacher and friend Annmarie Soul, and the wonderful Amy Harrington. Annmarie will cover all Tuesday and Thursday classes at Yoga Desa, starting January 10th until February 2nd! Amy will cover all Yogaworks classes in Westlake on Mondays & Fridays, as well as Tuesday and Thursday evenings, and Wednesday mornings in Woodland Hills. I am very grateful to them both. 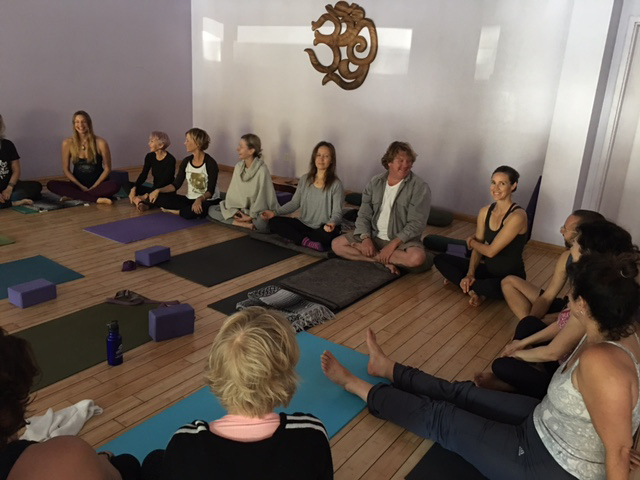 I am looking forward to seeing many of you on my Sunday morning class at 10.30am at Yoga Desa in Topanga! I will be back teaching my regular schedule on February 6th. On another note, our Spring retreat in Ojai March 17-19th is Sold Out! I cannot wait to take such a beautiful group of souls into a deeply enriching and nourishing weekend with co-teacher Annmarie Soul. We are already planning our next retreat this Fall, for those of you that weren't able to get into the Spring retreat, mark your calendars! 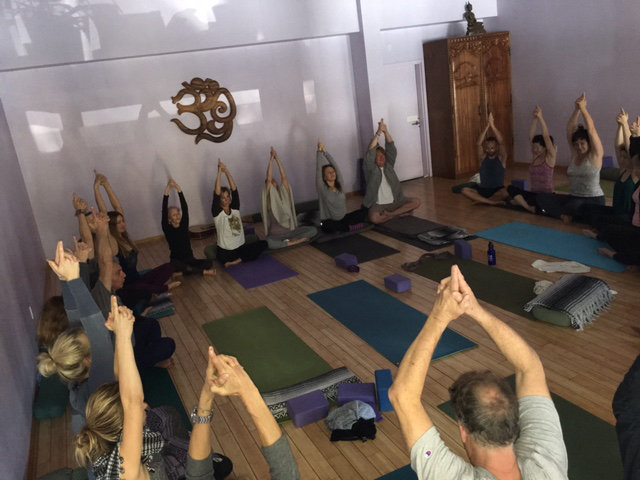 Thanks to all of you who came out to our New Year's Day class at Yoga Desa! What a great way to start the year. Are You Ready To Pamper Your Beautiful Self On A Three Day Journey Of Turning Inward And Practice The Ancient Art Of Self-Transformation? I am joining forces with co-teacher Annmarie on this retreat and together we lead you through a deeply nourishing and rejuvenating weekend of Yoga, meditation, Ayurveda talk and live music. The retreat will coincide with next year’s Spring Equinox, in an exquisite sanctuary in Ojai, at the foot of the Los Padres National forest, within walking distance from downtown Ojai. Come unwind with us, and enjoy the beauty of Ojai’s hiking trails, or soak in the saltwater pool and read. There will be time to connect and unplug, to socialize and find solitude. Our food will be prepared by a celebrated Ayurveda cook, who infuses his meals with love and gratitude. Give your Self a gift of selfLOVE and join us. Spaces are limited and will fill up fast, so reserve your spot now! I will be assisting Malachi Grieves' 200 Hour Teacher Training at Yogaworksthis coming January on Main St in Santa Monica. If you are looking for a solid foundation to teach asana safely and learn about sequencing, anatomy and pranayama this will be a good one. This training is in an intensive format, one month, every day except weekends, starting January 9th. I am happy to answer any questions you might have. I am beyond excited to be collaborating with Tracee Stanley on her next Para Yoga Training in Topanga beginning in March 2017. I will be teaching the Ayurveda module, something I am very passionate about. This teacher training will be taught over the course of 10 months (every 3rd weekend of each month) and will include in-depth knowledge about the subtle body, chakras, anatomy, the 4 desires as taught by Rod Stryker, Yoga Nidra, Ayurveda, the Yoga Sutras, Vinyasa Krama, pranayama and meditation. I couldn’t be happier about the feedback from my Ayurvedic Healing Blends! They are in strong demand and now available at The Healing Tree in Thousand Oaks, Kingfisher Road in Woodland Hills, and Topanga Mercantile in Topanga. I am working on 2 new blends that will surely transport you, one containing Jasmine, the other feels like a walk through a deep forest. You’ll have to wait for the next Newsletter to hear more! 1. Ayurveda talks about 3 seasons that correspond to the three primary doshas: Fall/Winter is Vata season (November-February), Spring is Kapha season (March-June) and Summer is Pitta season (July-October). Watch out for dry skin and irregular digestion, both Vata related and easy to balance. Use the Vata Massage Oil for your daily abhyanga. This oil is made from organic sesame and olive oil and is infused with herbs that are grounding, relaxing and warming, such as ashwagandha, sharavari, tulsi, bala and others. It is very light and luxurious. 2. Take extra care to keep your internal fire (agni) kindled. Eat warm, moist foods—think stews, soups, and root veggies — and save the salads and cold snacks for summer. Avoid raw or cold foods. Stewed apples, pears and prunes with cloves make a great breakfast! Eat more proteins and fats to rebuild the body and mind while insulating us from the colder months. Prepare foods that taste sweet, sour, and salty. Why these tastes? In each case, nature is providing something the body needs to pacify the change of season and balance the qualities of Vata. 3. Relax and sit down when you eat. 4. Stick to a routine: eat, practice, play, rest at the same time every day. 5. Wear hats or beanies to keep your head warm. 6. Snuggle up in front of a fire with a good book and a blanket and a cup of chai or hot tea. Warm milk (almond is fine) laced with ghee (or coconut oil), honey, cinnamon and cardamom is a perfect nighttime elixir (I add half a teaspoon of Ashwhaganda and Shatavari powder). 7. Go to bed earlier (before 10pm) and rub some more oil on your feet (sesame oil with lavender, or my Vata Balancing Blend). Highly sattvic in nature, it heightens awareness & promotes mental clarity.Tulsi is one of the most sacred plants in India, and is often kept in courtyards and houses for its purifying and beneficial influence on its surroundings. Tulsi promotes healthy circulation and supports proper function of the heart. It strengthens digestion and bolsters the immune system. It is said to open the heart and mind and bestow the energy of love and devotion. I LOVE the tincture, it is more potent than drinking the tea. To get it CLICK HERE. For now, stay well friends on the path, continue to thrive and shine your inner light. Fall is a major transition from Summer to Winter, and October is the month in which we can help our bodies make that transition as smooth as possible. We are experiencing shorter days and longer nights and are moving from the intense heat to lower temperatures and more wind. Our digestive system gets stronger in the winter and our parasympathetic nervous system (rest & digest) kicks in. As we transition out of Summer’s intensity and into Fall’s dry, cold and mobile qualities, there’s a few things we can do to stay stable and grounded: On colder days start incorporating more warming, nourishing dishes with plenty of good fats (ghee, olive oil, coconut oil) and establish a routine for yourself. On hotter days eat more ripe fruits and vegetable from the vine, but make sure that you’re allowing your body to yield to the seasonal changes by incorporating more warming stews, root vegetables and squashes into your diet. Amply apply the Vata Balancing Blend from inner wrists to elbow and let the grounding, stabilizing qualities of Jatamansi support you throughout the day. This particular blend also helps promote deep sleep if rolled on the bottoms of the feet at bedtime. I find myself alternating right now between the Vata and Kapha balancing oils, because Vata/Fall season also brings about the first moments of wanting to hunker down and sometimes succumb to sluggishness. The qualities of Bergamot (uplifting), Tulsi (heart opening and boosts vitality) and Eucalyptus (promotes clear breathing and enhances the flow of prana), are nicely balanced with just enough Cedarwood to keep us grounded. Enjoy those two blends and let me know how they affect YOU! Today in my Yoga class I offered students Viveka, the sacred blend as they got settled into savasana. Sattva is one of the three gunas (qualities, attributes), a philosophical and psychological concept developed by the Samkhya school of Hindu philosophy. The other two qualities are rajas (passion and activity) and tamas (inertia, destruction, chaos). I combine these 3 oils with Ylang Ylang to raise the spirit, open the heart and a few drops of Jatamansi to calm the nervous system. Every time I sit down to meditate I anoint myself with this oil, and thus begins the journey inward into the deepest layers of my own being.